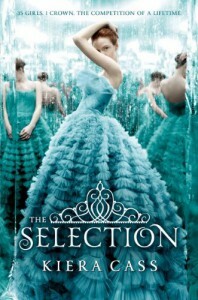 This book was touted as The Hunger Games (without the violence) meets The Bachelor. I must admit to having never watched The Bachelor. It just isn’t my thing, terrible reality TV is my thing and so I have to confess to having watched all the seasons of Flavor of Love and I Love New York. I can’t help loving trashy TV and at times I wish this book had been less Bachelor and more Flavor of Love, it would have been a lot more entertaining! The world building was interesting, the society is divided into caste’s ranked 1-8, I wanted more information as to how these castes formed and why they are ranked the way they are, but this is a planned series so I expect more information about the society in the upcoming books. I actually really liked the caste idea because it seems like something that could realistically happen. India is still operating in a caste society and it makes sense that under the proper conditions another similarly situated society could form in this fashion. America, the main character, is a 5 which means she is toward the bottom of the caste society and her family works as artists. After the urging of her boyfriend, Aspen, America puts her name in to the selection. The selection is a way for Prince Maxon, who has never had the opportunity to leave the castle and date to find a wife and future queen. America never really believes she will be selected until her name is called and her whole life changes. I liked America overall, she was relatable and her voice felt natural but at times she got on my nerves. I wanted her to give Maxon a chance and I kept having the feeling that she was being selfish. When I was watching Flavor of Love I always hated the girls that weren’t actually there for love, why come on the show if you aren’t going to give the guy a chance? America was one of these girls and so I had a hard time really rooting for her. The romance in this book was a love triangle *cue exasperated sighs*. But for being a love triangle I didn’t mind it all that much, in some weird way it made sense. I mean Maxon is dating 35 girls, why shouldn’t America have someone on the side? I have a feeling the love triangle will become more of an issue in the sequel, The Elite, and I think I will render an opinion on it then. Overall, I enjoyed The Selection. It was what I expected it to be and while it could have used a dose of crazy Flavor of Love drama it still kept my interest and has me excited for the sequel.